"H'el on Earth": "Girl Versus Goddess"
H'el has activated his Star Chamber. Superboy is in pursuit of the device. The giant cosmic being known only as the Oracle is approaching Earth, and time and space are going mad as a result of H'el's scheme to return to Krypton before it exploded. Wonder Woman, failing to convince Supergirl that H'el is not what he seems, is forced to combat Kara. With both matched in strength and speed, Diana uses her magic lasso on the Maid of Might. Realizing her error, Supergirl confronts H'el about the true fate of Earth should his plans succeed. H'el, however, cares nothing for what he considers to be a backward planet. He is currently giving Supergirl a difficult choice. Go back to Krypton with him to be with friends and family and allow the rest of the universe to be exterminated, or help the Justice League stop H'el before his insane quest brings about the destruction of all that exists. To Be Concluded in Superman #17. Story - 5: While I do wish more could have been done regarding Oracle and the changes in space-time, this issue is a pretty straightforward one. Perhaps we'll see more of what I wanted to see in Superman #17. We'll just have to see what happens when that comes out. 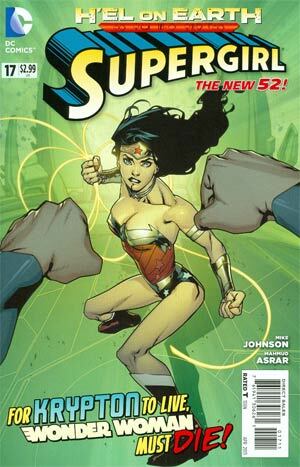 Unlike the battle with the Flash in the previous issue, the one with Wonder Woman was handled very well. I found that the two seemed kindred spirits of sorts. Under the right circumstances, perhaps Diana could take Kara under her wing as she did in Jeph Loeb's story in Superman/Batman. It would be nice if their relationship could be explored in future comics. Like most New 52 Supergirl books after number seven, this comic was a pretty fast and entertaining read as is the case with a majority of the "H'el on Earth" arc. I'm impatient for its conclusion, but I'm also sad to see it end. That hasn't happened much with recent crossovers. Thanks to the writers of the Superbooks for making me love comics again. Art - 4: Again, Mahmud Asrar needs to work on his Superman. Again, certain images look odd to my eyes. Yet again, the rest of the book is pretty much up to its usual standards. Asrar especially shines on the scenes of Wonder Woman's conflict with Supergirl. He's a fine artist, and I hope to see more of his work in the future. Cover Art - 4: Had there not been the title logo, one might think this was an issue of Wonder Woman. Aside from her fists, there is no sign of Supergirl on the cover. The art is great, and the image dramatic. Yet, it would been better to see Kara and Diana in profile or have an image similar to the book's opening page.